Hot summer days are almost impossible to imagine without air conditioning. It is a commodity that we all take for granted. Thinking back when air conditioning systems were more of a luxury, it is difficult to recall how we dealt with the heat. These days everyone has one and if they do not, they surely think about buying one. The only issue with air conditioning systems is that they are expensive. Living in an apartment or a house without air conditioning will automatically require a large investment if 2 or more rooms will require to have one installed. The solution that can save money is to get a portable air conditioner. These devices can be moved around wherever they are needed without much effort and they can offer the same performance as a regular AC. It may seem like a temporary solution, but it can also work on the long term. We went ahead and selected 10 such portable ACs. 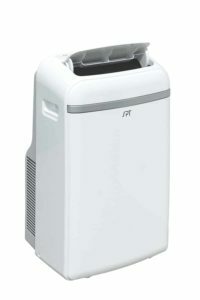 Here is what we found to be worthy to pick for our list of the top 10 best portable air conditioners. 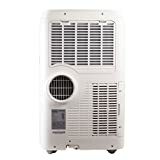 Hainer HPP08XCR is a great solution for the ones that need a portable air conditioner. It is a simple and compact device that is easy to move around and has a very straight forward setup. In just a couple of minutes, it is ready to cool a room of up to 200 square feet. The model offers a cooling power of 8000 BTU which is enough for a small room. It includes a small remote control that can access all its functions and features including a 24-hour timer with automatic on or off programming. Looking at some of its other features, the model offers 3 fan speeds and a washable filter that is easy to take out. Alternatively, the unit can be set or programmed using the physical buttons placed on top that also feature a small LCD screen to show the current settings. 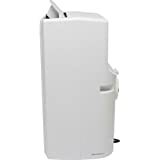 DeLonghi PACAN140ES.WH-3A is a great product and even if it is not the cheapest air conditioner it still offers great value for money. It is quite powerful but quiet and can cool rooms as large as 600 square feet. The air conditioner has a very simple installation and does not require any kind of tools. In just a couple of minutes, it can be all ready and working. The filters it uses can help reduce odors, prevent the growth of mold and mildew. Being a mobile unit means that it comes with caster wheels. It features no-drip technology that recycles condensation within the unit. The model has all the controls on top of the unit, but it also features a remote. It comes with a 12 hour on and off timer and 3 fan speeds. SPT WA-1420E portable air conditioner can be a great solution for the ones that need a practical way to deal with the summer heat. It is a compact unit that delivers a decent amount of power. With 14,000 BTU cooling power. Like most other portable air conditioners, the SPT has 3 fan speeds. It can only cool air as it does not have a heater, but it does have additional functions. It can help dehumidify the air and with the aid of its filters, it can also reduce odors in the room. Because it is such a powerful air conditioner, the model can be used in rooms as large as 700 square feet. Installation takes only a few minutes and for extra convenience, it has a self-evaporative system. It includes a small remote and has all the functions and controls of the unit as well. 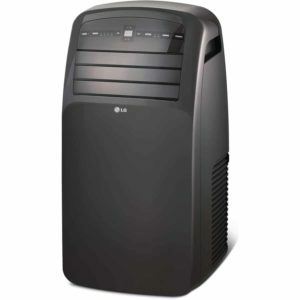 LG portable air conditioner is a popular pick as it is not that expensive and quite compact. The model was made mostly for small rooms of up to 300 square feet and has a cooling power of 7000 BTU according to the DOE 2017 Standard. 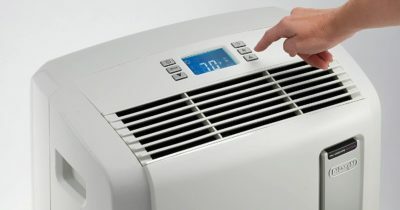 Besides being able to cool a room, the air conditioner also works as a dehumidifier. It can collect up to 1.2 pints per hour by mixing cool dry air warm air from the room. The model also disperses air more efficiently to avoid creating hot spots in the room. Setting up the unit takes only a few minutes due to its tool-less design. It features a small LCD remote and digital controls directly onto the unit. It has a 24 hour on/off timer and an oscillating vent for even air distribution. 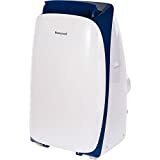 Honeywell Contempo portable air conditioner in one of the cheaper models that managed to get selected for our list. It offers great value for the money. The model is available in a 10,000 BTU version as well as two larger models of 12,000 BTU and 14,000 BTU. The standard 10,000 BTU unit does not include a heater and can cool rooms of up to 450 square feet. It has built-in overload protection and automatic wind motion control for even air distribution across the room. As far as accessories go, the unit does include a remote, but it also has digital control placed on the unit. For extra features, it is worth mentioning the dual filter system that cleans the air and the auto evaporation system that eliminates the need for a bucket. 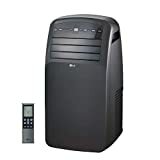 LG LP0817WSR portable air conditioner is a good option for the ones that are on a tight budget. It is an 8,000 BTU unit, capable of cooling rooms of up to 150 square feet which is not a lot but should be enough for a small room. The model also acts as a dehumidifier, capable of collecting 1.8 pints per hour. It features an auto evaporation system which eliminates the need for emptying a collection bucket. The unit takes only a few minutes to setup and has a very compact form factor. For extra features, the most notable one is the capability to distribute the cool air evenly throughout the room. It has auto swinging louvers and multiple fan speed settings. A remote has been included in the kit and digital controls were placed directly on the top of the unit. BLACK+DECKER is surely a brand that needs no introduction. Their 14,000 BTU unit offers great performance for not a lot of money. It is a simple portable unit that takes only a couple of minutes to setup and can handle rooms of up to 350 square feet. Being designed to easily use, the unit features an automatic water evaporation system as well as even air distribution to avoid leaving hot spots in the room. It has 3 operation modes to choose from and multiple fan speeds. The unit comes with a few extras such as a window exhaust installation kit, a remote and a small instruction booklet. Maintenance is fairly simple as the filters are easy to remove and can be washed. Last but not least, it has a 24 hour on/off timer and swinging air vents. 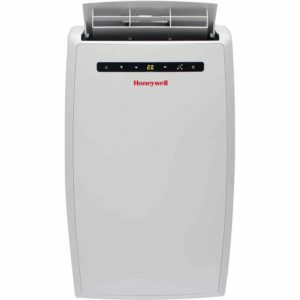 Honeywell MN12CES is a cost-efficient machine that can cool rooms of up to 450 square feet. It is compact, easy to use and just as easy to install. In just a couple of minutes, the unit can be moved from one room to another and have it ready and run. The model is being advertised as having a 12,000 BTU cooling power with a no-bucket design. It can work as a dehumidifier, capable of collecting up to 79.2 pints of water per day. The filters are quite easy to remove and can be washed. One useful feature is the fact that the unit is quiet. It has a touch front-facing control panel with a small digital display as well as a remote that can be used to adjust the fan speed or set an on/off timer of up to 24 hours. Whynter dual hose portable air conditioner is one of the best-selling models picked for our list. 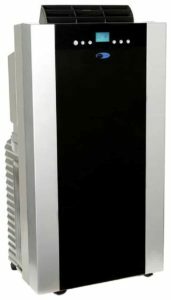 It offers great performance in a compact form factor with a cooling power of 14,000 BTU which will be enough for rooms of up to 500 square feet. 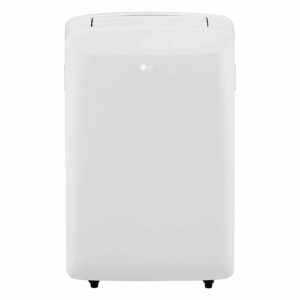 Like most other portable air conditioners, it also works as a dehumidifier, having a capacity of 101 pints per day. The fan has 3 selectable speeds while the air vents can be set to swivel for an even cool air distribution. The kit includes the window installation kit along with intake hoses. It also has a small remote but alternatively, the unit can be controlled using the function buttons placed on the top. The filters used for the model air washable while the compressor used is very quiet. 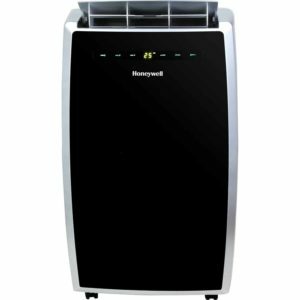 Honeywell MN10CESWW portable air conditioner is the ideal pick for the summer without having to break the bank. 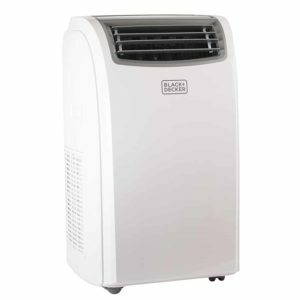 It is a compact air conditioner that is easy to move from one room to another and has a very simple setup. The unit has a 10,000 BTU rating, making it capable of cooling rooms of up to 350 square feet. It has a no-drip design, without needing any type of bucket. The auto-evaporation system will eliminate the water completely stress-free. The dehumidification feature will be able to collect up to 70 pints per 24 hours. 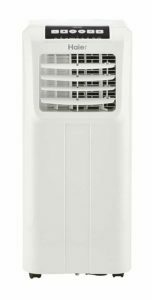 Like most other portable air conditioners, the unit includes a small remote and has a 24 hour on/off timer. The filters used are very easy to remove and can be cleaned by simply rinsing them. Portable air conditioning systems are quite similar to the way regular air conditioners work. They have the same working parts, but everything is compacted to be more practical and easy to move around. When picking a portable air conditioner, there are a few things to look out. With a little bit of attention to certain details, it is possible to avoid a situation in which hundreds of dollars have been spent on an air conditioner that may not be able to cool a particular room. Filter maintenance. The vast majority of portable air conditioners use filters to retain some of the impurities in the air. Some have replaceable filter while others have filters that can be cleaned. Cooling power. The cooling power of the air conditioner influences the price and how big the room can be in order for it to be cooled efficiently. Most manufacturers state clearly the maximum room size for which their unit is recommended. Dehumidification feature. Almost all air conditioners have a dehumidification function. However, not all of them have an auto evaporation system. Some still require the user to get rid of the water that the unit retains from the air. 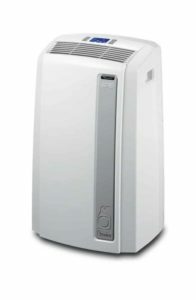 Portable air conditioners are truly a great solution to deal with the heat. They are cost effective and their mobility can even help save more money by not having an AC installed in two or more rooms. The true value of a portable air conditioner shows when they are needed in one room and at a certain point, a different room needs to be cooled. If the portable air conditioner is powerful enough it will be able to make those rooms much more bearable. In the end, this aspect matters the most as a small unit may not be able to cool a large room. 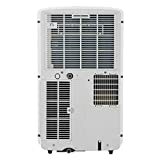 For this reason, we included in our list a wide variety of portable air conditioners that come with a fair price and require little to no maintenance at all.